As 2008 draws to a close, we can start to assess the Thoroughbred sire crop that entered stud in 2003. At this point, those stallions have had their all-important first and second crops complete their 3-year-old season. 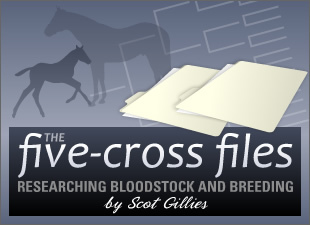 I compared the year-to-date 2008 Third-Crop Sires list against the 2007 Second-Crop Sires list (BloodHorse.com lets you view lots of leading sire lists for free!) and noticed that, while the top of the leaders charts has stayed pretty close from their first crops to their second crops, a few sires have shown significant improvements. This is noteworthy because the quality and quantity of mares bred in a stallion's second season will often drop dramatically as breeders wait to see how the sire's first crop fares at the sales and on the track, before committing to an unproven stud that doesn't have the advantage of first-year excitement. The second and third crops are somewhat of a no-man's-land for stud farms, and are often the most challenging of a stallion's career. So -- theoretically, at least -- good results from a stallion's second and third crops identify him as a success even with non-top tier mares. Street Cry (IRE) (SRO) and Johannesburg (SRO) maintained their 1 - 2 spots. Not a real surprise on either count. Street Cry is in a class by himself -- one of those sensational sires that you just know will have a longterm influence on the breed. No wonder he's tops on yet another leaders list. And Johannesburg apparently has it all -- the pedigree, the juvenile race record, and a stud farm that has supported him with terrific mares. Jump Start (SRO) is an exciting son of A.P. Indy, and his 10 stakes winners of 2008 helped to move him from #8 last year to #4 in 2008. Impressively, this was done without the influence of a single stand-out progeny (in fact, he's the only top-7 third-crop stallion whose best runner earned under $300,000). Pure Prize (SRO) climbs only one notch -- from #10 to #9 -- but the son of Storm Cat had an impressive 68.1% winners from runners in 2008, and 10.6% stakes winners. E. Dubai (SRO) echoed Jump Start's rise, with his four-notch move to #5 on the third-crop sires list. Two-year-old buyers early this year foresaw a good campaign for the 1998 son of Mr. Prospector -- his six foals of 2006 that sold averaged $162,000. Mizzen Mast (SRO) jumps three spots to #3 in 2008, in what can be seen as a nice tribute to his sire Cozzene, who died in October after a long and successful stud career. Mizzen Mast's 14 black type progeny gave him the big jump this year. Graeme Hall (SRO) came tantalizingly close to breaking the Top 10 barrier, but wound up two spots at #11. On the positive side, he added a second 2-year-old grade I winner and 10% of his 2008 winners were stakes winners, making the year a strong one for the son of Dehere. Red Bullet (SRO) gained more ground than any other top sire, rising seven spots from #19 in 2007 to #12 in 2008. He proves to be a value play for breeders in 2009, with his $5,000 fee only half what it was in 2008 and one-sixth of his entering fee. The Unbridled stallion got his first graded winner this year and saw his progeny pass $2.5 million in annual earnings.